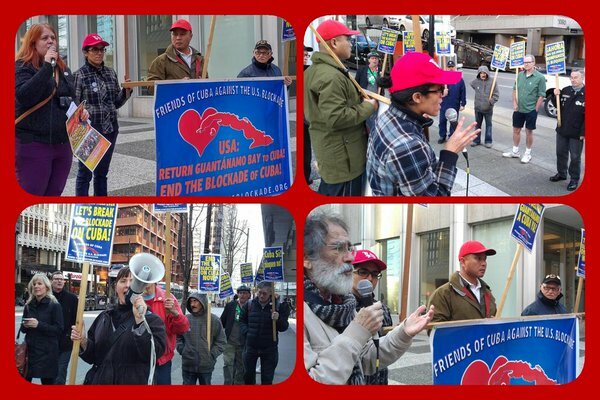 On the eve of U.S. President Barak Obama’s visit to Cuba, March 17, 2015 Friends of Cuba Against the U.S. Blockade – Vancouver (FCAB-Vancouver) held their 7th consecutive monthly action to demand an immediate end to the U.S. blockade on Cuba and the return of Guantanamo. Loud chanting of “End the Blockade on Cuba Now!” and “Abajo el Bloqueo!” could be heard all along the busy street, as supporters of Cuba raised Cuban flags and their voices for an end to the over 55 year-old U.S. policy that has cost the Cuban economy over 1.1 trillion dollars since it was first implemented. The protest, held at the base of the U.S. Consulate in Downtown Vancouver, was emceed by Azza Rojbi, co-coordinator of FCAB-Vancouver. Throughout the protest, the significance of the visit of President Obama, the first U.S. President to travel to Cuba in 88 years, was reflected in the speeches that were given by solidarity activists at the protest, each of whom focused on a different aspect of the record of U.S. attacks on the Cuban Revolution. Speakers at the picket included, Nino Pagliccia, editor of the book “Cuba Solidarity in Canada: Five Decades of People-to-People Foreign Relations,” Alison Bodine, from the Fire This time Venezuela Solidarity Campaign and Tamara Hansen, the Coordinator of Vancouver Communities in Solidarity with Cuba (VCSC). There was also a special guest joining this month’s protest, a long-time social justice activist and organizer with the Seattle/Cuba Friendship Association, Jim McMahan. 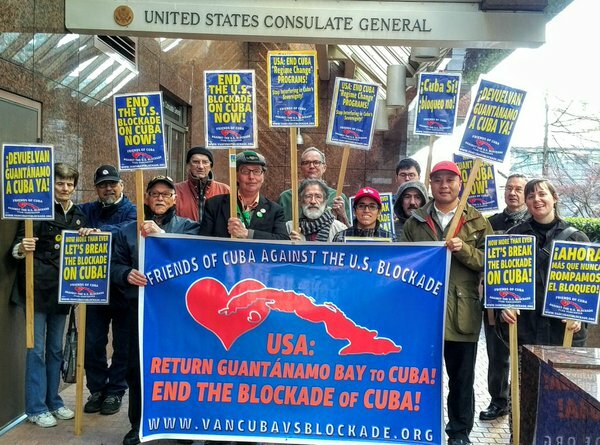 The Vancouver protest also received a message of solidarity from organizers with Ottawa Cuba Connections, which organizes a protest at the U.S. Embassy, also on the 17th of each month in coordination with Vancouver. During U.S. President Obama’s time in Cuba, Cuban President Raul Castro made it very clear when he said, “The blockade is the most significant impediment for the development of the Cuban people, that is why its elimination is essential for the normalization of relations.” Today, relations between the U.S. and Cuba are still anything but ‘normal.’ Cuba supporters around the world must use this occasion to increase our campaign in solidarity with Cuba and unite around the world to make our demand clear that we want an immediate end to the cruel U.S. Blockade and the immediate return of Guantánamo Bay to Cuba! For photos of this protest, and other FCAB-Vancouver actions, as well as updates and analysis on U.S./Cuba relations visit their website at www.vacubavsblockade.org. U.S. Government Stop the Campaign of ‘Regime Change’ in Cuba and Immediately Stop Interfering in Cuba’s Sovereignty Self-Determination!